After making the decision to get a roof replacement, the next challenge that homeowners face is deciding what type of roofing material they want for their home. Modern technology has continuously evolved the roofing industry and led to the development of new materials to choose from. It can be overwhelming to decide what the best option for your home is, which is why Trinity Exteriors, Inc is here to help. We provide high-quality products that will give your home a beautiful and durable roof no matter what material you choose. Call us today or click below to learn more about these roofing materials and get a roof replacement cost estimate! The Trusted Trinity Team crossed the river to replace this roof in Hudson, WI. This homeowner was referred to Trinity after their neighbor had their steel siding replaced with new LP SmartSide engineered wood siding. The Storm Consultant found the roof had suffered injury from hail, and once the insurance claim was approved, crews removed the old roof to install new Owens Corning Duration in Brownwood. The Trinity Exteriors Storm Team helped these homeowners through the restoration process. There was a free initial inspection to determine if there was any hail damage. Then, the consultants educated the homeowners on the pros and cons of each shingle style so they could choose the right one for the house. Actual construction of the new roof lasted about a day and finished with a thorough clean up. This house features Tamko Heritage Woodgate in Weathered Wood shingles. While most roofing contractors don't go out for small repairs, Trinity Exteriors always takes care of its previous customers no matter what the problem. In this case, strong winds had removed some shingles, so Trinity crews secured new shingles down (IKO Dual Brown) as well as a matching ridge cap. The roof looks as good as when Trinity Exteriors first installed it! Description: The roofing and siding of this Stillwater, MN house was replaced after incuring severe hail damage in spring of 2015. Description: Storm damage required replacement of the asphalt shingles and skylights for this Stillwater, MN home. Description: These homeowners took advantage of a spring hail storm to upgrade their roofing and siding with the help of contractor Trinity Exteriors. Description: After the asphalt shingles on this Stillwater roof were impacted by hail stones, Minneapolis roofing contractor Trinity Exteriors fully replaced the old shingles with new Tamko shingles. Description: This Stillwater roof was dented by hail stones and needed a full replacement. 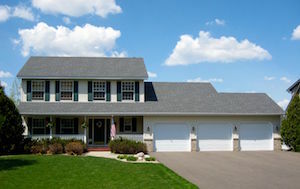 The homeowners chose made-in-Minnesota Owens Corning asphalt shingles. There are shoes, and then there are Jimmy Choos. In the world of asphalt shingles, there are shingles and then there are Owens Corning Duration Designer Colors. These homeowners in Stillwater stepped up their style when a hail storm hastened their roof replacement. After mulling over all the colors and features of different shingle brands, they selected the OC Duration in Pacific Wave. As added protection, the homeowners opted for the Owens Corning warranty. With a good looking, durable roof, they're free of worries, which means we've accomplished our purpose! Lakeland Township, located in the Twin Cities North Metro, was one of many locations feeling the impact of the June 2017 storm. After the Trinity Exteriors storm consultant found dents from hail stones, the homeowners filed an insurance claim. For their new roof, they selected Owens Corning Duration in Driftwood. Trinity's crews installed the shingles within a day, and the homeowners were happy with the easy process and end result. Restoring a roof after a hail storm can seem like a daunting challenge for homeowners. But with the help of Trinity Exteriors, a roofing contractor with more than 10 years in the industry and thousands of homes restored after storms, this Stillwater homeowner had nothing to worry about. Once the homeowner's insurance company approved the claim, Trinity Exteriors installed Owens Corning Duration in Desert Tan shingles for a new, durable roof. The hail-damaged roof of this Stillwater home was efficiently replaced by Trinity Exteriors with Owens Corning Duration shingles in Driftwood, one of the most popular colors in Minnesota. Hail damage isn't always bad news. First, choosing the right local roofing contractor means the project moves smoothly and the representatives communicate well with the homeowners. Second, hail damage may mean a materials upgrade for your home, as was the case for this Stillwater house. Trinity Exteriors replaced the old roof with Owens Corning Duration shingles in Teak. The most dramatic change, however, was when the homeowner were able to transition from aging wood siding to Edco Steel in Desert Tone. The home looks modern and is certainly longer lasting with moisture-resistant siding. Rich in history, Stillwater, Minnesota has long been known for its gracious homes and this one of Over Look doesn’t disappoint. Recently A hail storm can through damaging their shingles and beautiful Cupulo’s. The homeowners sought out the roofing companies with the highest ratings and Trinity Exteriors, bubbled to the top! A beautiful upgrade with top quality. Owens Corning TruDefinition Duration shingles in their Designer series is shown here in the beautiful color of palette of “Storm Cloud." The Metro North is still recovering from the massive amounts of hail damage that impacted homes across the Minneapolis area. One of Trinity's Claims Specialists met these Lake Elmo, MN homeowners who needed a roof replacement when their insurance claim was approved. The Trinity crews got into the project quickly to put in a new roof and perform a spotless cleanup within a day. The homeowners chose new Owens Corning Duration shingles in Teak. As part of our purpose to take the worries away, Team Trinity makes the restoration as easy as possible. The process starts with a free inspection by an experienced and qualified Restoration Consultant. This person is also on site as your adjuster conducts their inspection, simply to offer our expertise on hail damage. Once the insurance claim is approved, our dedicated crews remove the old roofing materials and, in this case, install new Owens Corning Duration in Driftwood. Each project is completed when we do a thorough cleanup and final inspection. After hail ruined this home's shingles, the homeowners hired Trinity Exteriors to replace them with a new Owens Corning roof in Onyx Black. Trinity Exteriors, one of the leading roof replacement contractors working in storm areas throughout the Twin Cities, replaced this Lake Elmo roof quickly and efficiently. The homeowners selected Owens Corning During in Onyx Black. Description: June 2014's hail storm badly impacted many homes in the Farmington. MN area, including this residence. Wind had torn off a section of the siding, which we were able to easily reset so it didn't come off in future storm. For the roofing, we had to tear off the entire sheath of hail damaged shingles in order to repair some of the decking under the roof with new OSB. Gaps in decking can cause new shingles to fault from moisture exposure. The homeowners selected their new shingles for us to install in Thunderstorm Grey color. When these homeowners had to replace their roof, they opted for products with top-of-the-line durability and style. The Trinity Exteriors crews cleared away the old shingles to put in the new Owens Corning TruDefinition Duration Storm shingles in Teak. These shingles feature Class 4 impact resistance, the highest level for asphalt shingles. The color upgraded the home's curb appeal with a more modern look. The final step was to put in a new Velux skylight. Description: Roofing contractor Trinity Exteriors masterfully coordinated this large-scale project to restore the roofs of a veteran rest camp after a severe 2015 hail storm. Our crews replaced the roofs of 21 buildings while working around the camp's visitor schedules. Description: These customers wanted to replace their aging roof. They found Trinity Exteriors through the customer reviews of Five Star Rated for Home Services and hired us to remove the old asphalt shingles and replace them with new shingles that will last decades. Description: The roof and gutters of this Inver Grove Heights home suffered denting from hail stones after a large storm in fall of 2016. Trinity Exteriors replaced the roof and installed new seamless gutters. Description: After hail damaged this Inver Grove Heights house, the homeowners hired Trinity Exteriors to replace the roof. It's stunning how a change in shingle color was able to lend this Inver Grove Heights home an updated, modern look. A hail storm forced the homeowners to consider replacing their 15-year-old roof. Trinity's Claim Specialist performed an initial inspection, which revealed a significant number of hail damage dents on the shingles. The homeowners started their insurance claim process and after its approval, our crews pulled off the old building materials to lay down new GAF Timberline Prestique in Charcoal. They were careful, after removing the previous shingles, to inspect the decking on the back elevation, which the homeowners believed at risk for water damage. Everything looked in good shape, and the house passed the final inspection with flying colors! These Inver Grove Heights homeowners made sure to have a contractor replace their roof before the insurance deadline after a hail storm. For their new shingles they selected Tamko Heritage in Rustic Black. Description: The roof of this Inver Grove Heights home was showing dire signs of age, so the homeowners hired roofing contractor Trinity Exteriors to fully replace the roof, reglet and vents. When there's hail, there is likely hundreds of homes that need new roofs. This home in Inver Grove Heights needed a full replacement and some siding repair after hail stones hit the materials. Trinity Exteriors' crews tore off the old materials and installed Owens Corning Duraiton in Desert Tan. Description: Hail stones from a heavy storm in 2014 severely impacted the roof of this Lindstrom, MN home. The homeowners heard of Minneapolis roofing contractor Trinity Exteriors and called the company for a free estimate. We were able to help them through the insurance restoration process and fully restore their roof with new asphalt shingles. In one of the first hail storms that hit the Twin Cities metro this year, this home's shingles were damaged beyond simple repairs. The insurance company approved the homeowners' insurance claim so our crews could start work quickly by ripping off the old shingles and putting on new Owens Corning Duration shingles in Teak. As an added benefit, roof repair can be handled relatively easily with asphalt shingles. The roofing pros at Trinity Exteriors, Inc can help you decide what type of asphalt shingles are the best fit for your home depending on your needs and budget. Unmatched beauty. Although there are some maintenance challenges, it's hard to beat the appearance of wood shingles. Wood is another common material for residential shingled roofs. Wood shingles have a beautiful finished appearance and generally provide very good durability. Wood shingles are cut with a saw and have a consistent thickness and shape, while wood shakes are split and are usually thicker and rougher. Either option can be used depending on the look you want to achieve and the style of your home. While wood shingles and shakes are a great roofing material, there are a couple drawbacks. These roofs can be expensive to install, and they will require more maintenance than an asphalt shingle roof. However, the benefits of wood shingles still make them a popular choice -- especially for historic homes. Everything has been fantastic. I haven't had a single problem working with Trinity Exteriors. I would like to recognize everyone I worked with. They were all very helpful, if they did not know something, they found it out. Dennis explains that he was pleased with how quickly Trinity Exteriors was able to provide him with a bid that was detailed and competitive. The entire shingle and gutter installation looks great. Outstanding job on this. The roof edging and gutter drip edge added a real professionalism to the job. You can use me for a reference anytime. Since having my shingles done, my roof looks beautiful. I was most satisfied with the roofing experience, it was a fine job on the roof. It looks beautiful and has not leaked since. Communication: Easy to talk with. They responded quickly to questions & concerns. Choosing the right roofing material and contractor is essential if you are considering replacing your roof, and we can help you find the best option for your home. We provide high-quality materials and expert installation, and you can count on receiving a beautiful, durable roof. Call us today to get started with an estimate in St. Paul, Minneapolis, Eden Prairie, Cottage Grove, Minnetonka, Burnsville, Savage, Chanhassen, Rosemount, Inver Grove Heights, and the nearby areas!